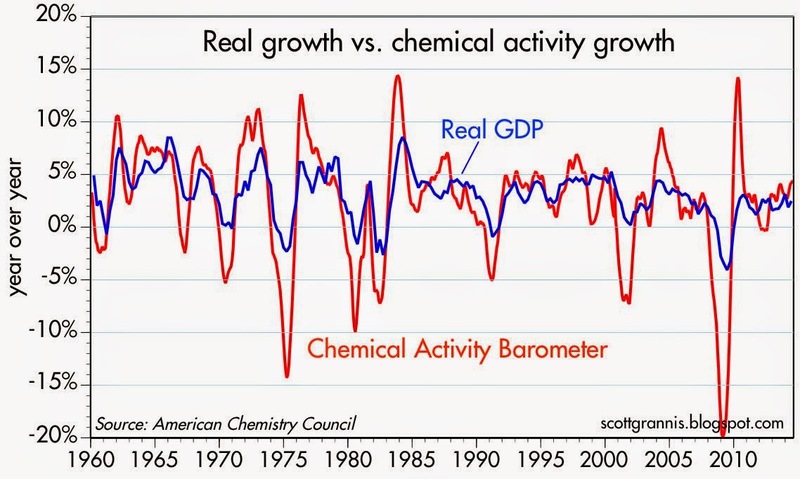 Here is a collection of charts that feature real, physical measures of the growth of the economy. They are all consistent with an economy that continues to expand. 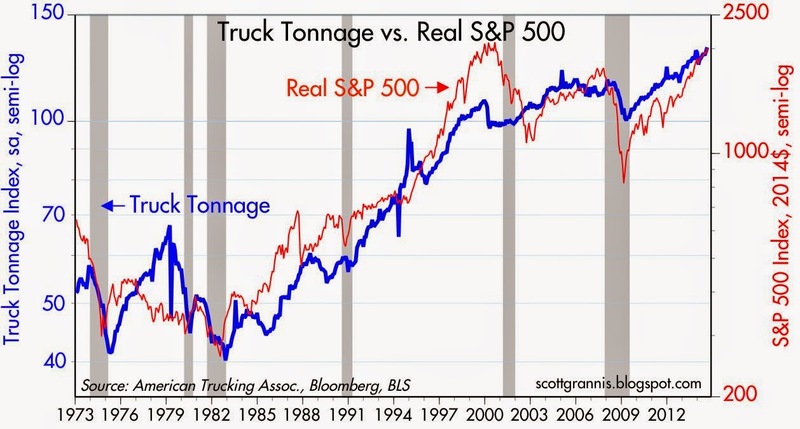 Truck Tonnage. This data is collected by the American Trucking Association. It measures total for-hire truck tonnage, and is seasonally adjusted. 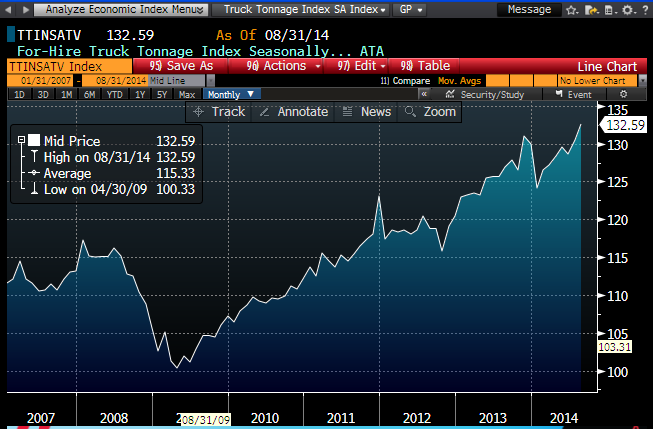 Truck tonnage in August reached a new all-time high, and is up 4.5% over the past year. The top chart shows the index from 2007 on, while the bottom chart shows the index from 1973 on, and compares it to the inflation-adjusted S&P 500 index. The point of this latter chart is to show that the rise in the real value of equities is proportional to the increased amount of goods hauled around the country. The equity market, in other words, is not unhinged from reality or caught up in a bubble. I note that the chart did suggest equities were in a bubble in the late 1990s, while equities appeared to be extremely undervalued in the Great Recession. 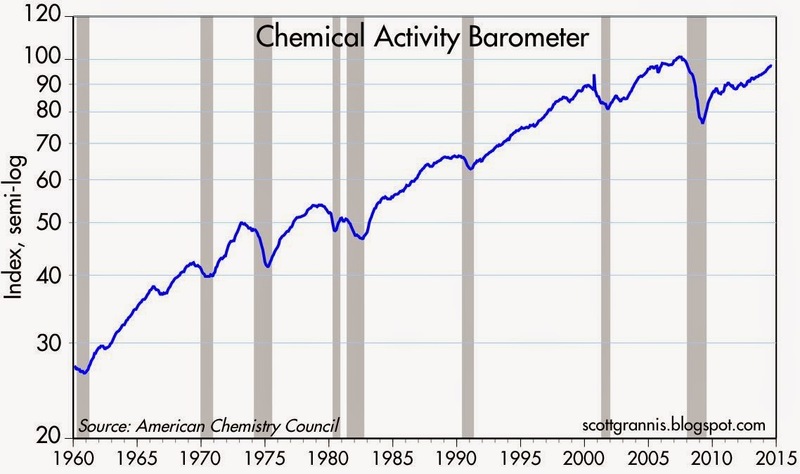 Chemical Activity. 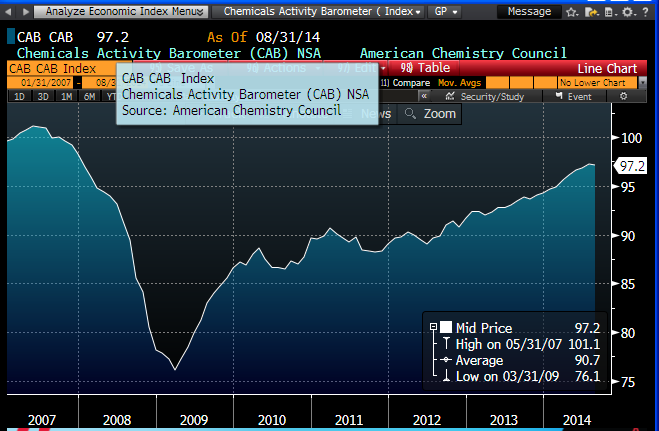 This data is put together by the American Chemistry Council, and is derived from a composite index of chemical industry activity. The top chart shows the history of the index, the bottom chart zooms in on the last seven years of the index, and the middle chart compares the year over year growth of the index to real GDP growth. Although the growth of the index has slowed a bit in recent months, it is still consistent with an economy that is growing 2-3% per year. Architecture Billings. The American Institute of Architects every month asks its members whether their billings for work on the board have increased, decreased, or stayed the same. Last August marked the most number of positive responses since the Great Recession. 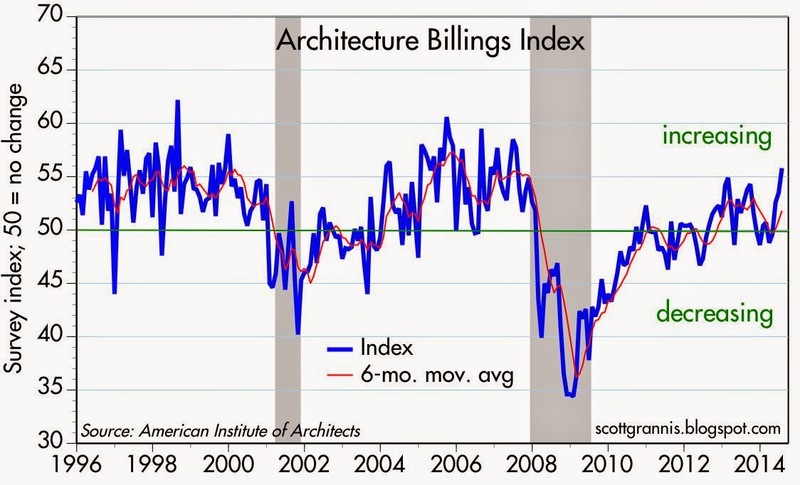 Even on a 6-month moving average basis, the index shows that the nation's architectural firms are experiencing increased demand for their services, a good indication that commercial construction activity will be expanding in the future. 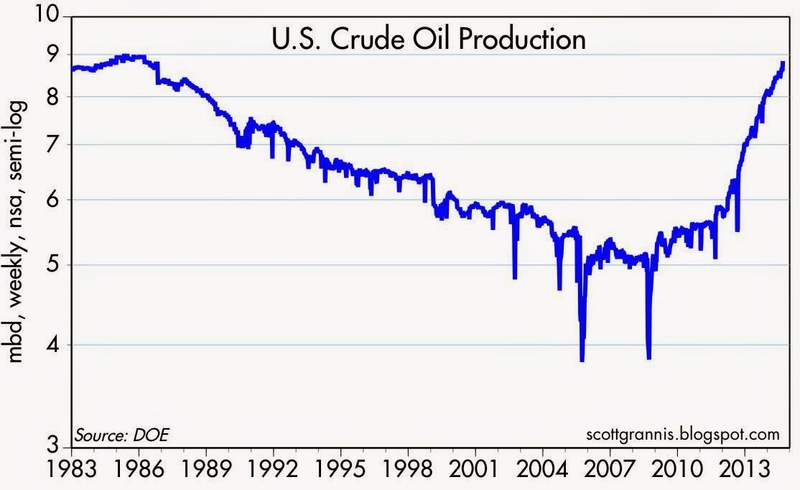 Crude Oil Production. Thanks to fracking technology, U.S. crude oil production has grown by leaps and bounds—up 54% in the past three years, for an annualized gain of an astounding 15% per year. It's hard to underestimate how much the ripple effects of such an increase are affecting overall economic activity. 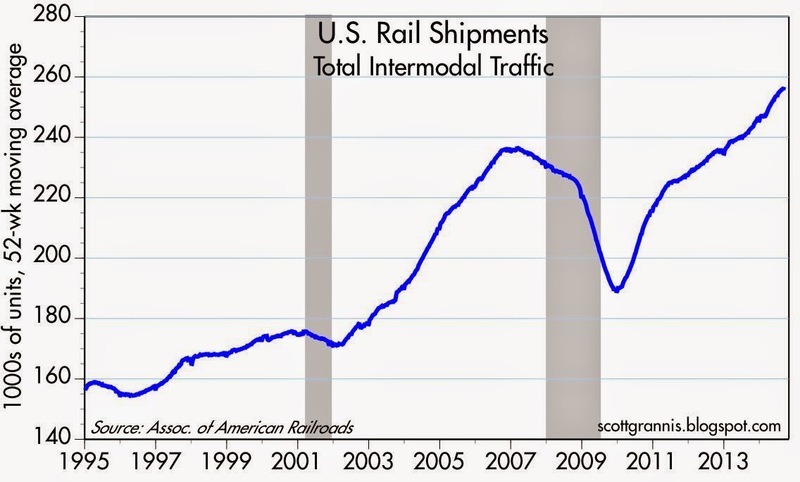 Intermodal Rail Traffic. The American Association of Railroads reports that rail shipments of freight containers in the year ending September 12th rose 6.5% from the previous annual period, and registered a new all-time high. Well, yes and no. A lot of these charts show excellent growth in the 1980s and 1990s with the poop out starting in the year 2000 coincident to the Bush and Obama administrations and a central bank that is just too tight. Ed Yardini: Why is the yield curve flattening?? n a 9/9 interview on CNBC, Jeffrey Gundlach, CEO and CIO of Doubleline Capital, provided some very useful insights into the recent behavior of the bond market and its implications for Fed policy. He noted that short-term interest rates have been rising, while bond yields have been falling. The yield curve has flattened since the start of the year. Through Friday, the 2-year Treasury yield rose 21bps ytd to 0.59%, while the 10-year Treasury yield has dropped 45bps to 2.59%. Gundlach may be right. However, I have been noting that the widely unexpected drop in US bond yields since the start of the year is mostly attributable to the plunge in Eurozone yields. They declined broadly on Friday, with the yield on the 10-year German government bond falling to 1.04%. The yield on the 10-year government bond in Spain dropped to 2.19%. On Thursday the ECB announced that Eurozone lenders had borrowed just €82.6 billion through the new TLTRO, falling short of many analysts’ expectations and increasing the likelihood that the ECB will have to implement QE despite legal hurdles to doing so. Re: the yield curve flattening. While the curve has indeed flattened year to date, it is still very positively sloped, and nowhere near flat enough to presage a recession. The yield curve always tends to flatten as the business cycle matures, but the 2-10 spread is still almost 200 bps. The time to worry about the economy is when it falls to 50 or so.